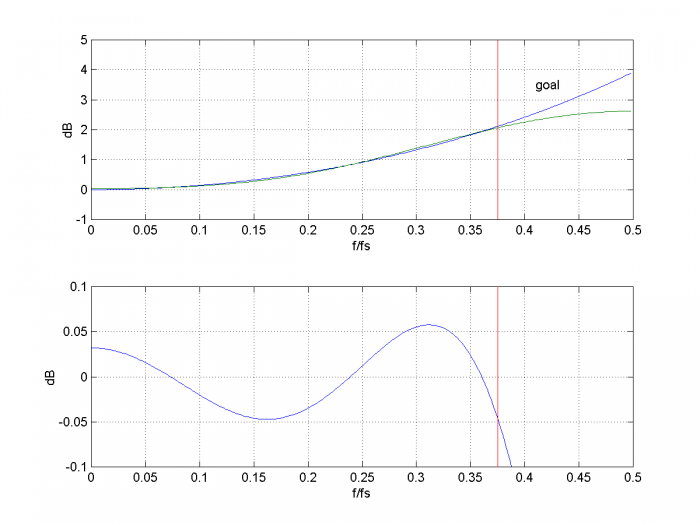 This post provides a Matlab function that designs linear-phase FIR sinx/x correctors. 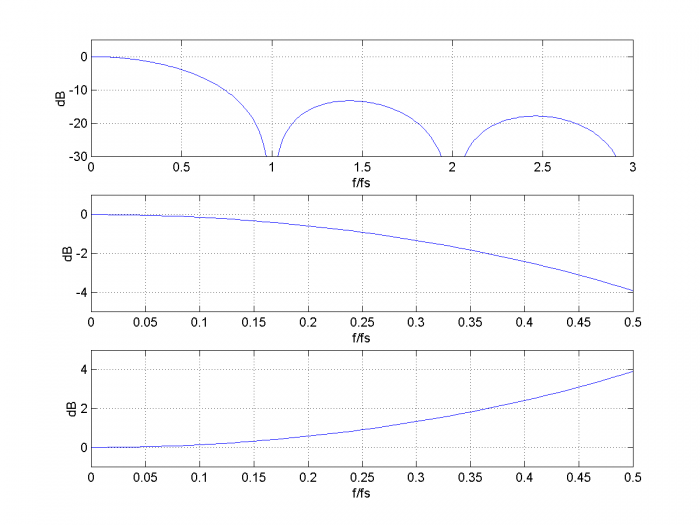 It includes a table of fixed-point sinx/x corrector coefficients for different DAC frequency ranges. H(f) is called the sinx/x or sinc function. The dB magnitude of H(f) is plotted at the top of Figure 1, were we have ignored the scale factor Ts. The usable range of the DAC output spectrum is normally limited to frequencies less than fs/2. As shown in the middle plot of Figure 1, the sinc function rolls off about 3.9 dB over 0 to fs/2. Whether compensation of the sinc roll-off is used depends on the particular application. If compensation is required, we need a function with response that is the inverse of the sinc, as shown in the bottom plot in Figure 1. We’ll call this the goal response. Note that the corrector response need only match the goal response up to the maximum frequency in the DAC spectrum. It is helpful if the maximum frequency is not too close to fs/2 -- this eases the requirements on the corrector and DAC reconstruction filter. 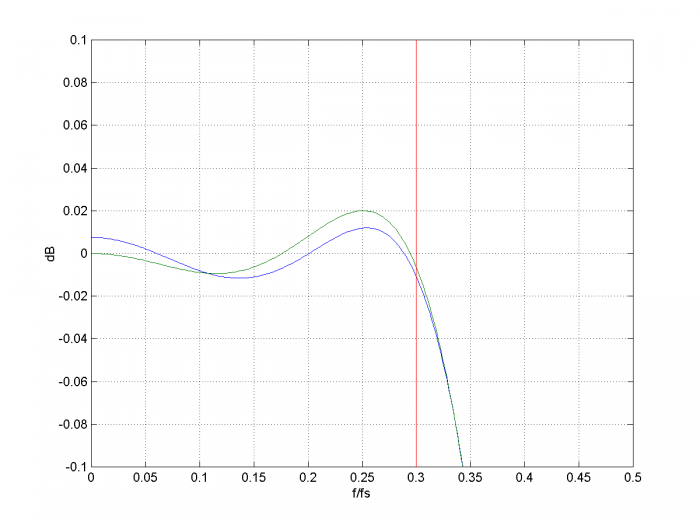 The DAC reconstruction filter is an analog lowpass filter that attenuates the images of the sampled output of the DAC. In a DSP system, the sinx/x corrector is typically placed just before the DAC input, as shown in Figure 2. Figure 1.Top: sinc function dB-magnitude response, f = 0 to 3fs. Middle: sinc function dB-magnitude response, f = 0 to fs/2. Bottom: Inverse sinc response, f = 0 to fs/2. Figure 2. sinx/x corrector in a DSP system. fmax = maximum frequency of DAC output signal, Hz ( fmax < .499*fs). For best results, ntaps should be odd. The frequency response of these coefficients is plotted in the top of Figure 3, along with the goal response (see Appendix for the code that computes the responses). The vertical red line is at f = fmax. The overall response of the DAC plus sinx/x corrector is shown in the bottom of Figure 3. The ripple of the overall response is less than +/- .015 dB. Note that the gain of the sinx/x corrector is 1.164= 1.32 dB at f= fmax. Thus, at the corrector input, the peak-to-peak signal level of a sinewave at fmax should be backed-off 1.32 dB from full-scale to avoid clipping. A simple way to achieve this is to incorporate a gain of 1/1.164 = 0.859 (or less) into the corrector. For example, incorporating a gain of ¾ would work. The frequency response is plotted in the top of Figure 4, along with the goal response. The overall response of the DAC plus sinx/x corrector is shown in the bottom of Figure 4. The ripple of the overall response is roughly +/- .05 dB. The gain of the sinx/x corrector is 1.269= 2.07 dB at fmax. Figure 3. sinx/x corrector with fmax= 0.3*fs and ntaps= 5. 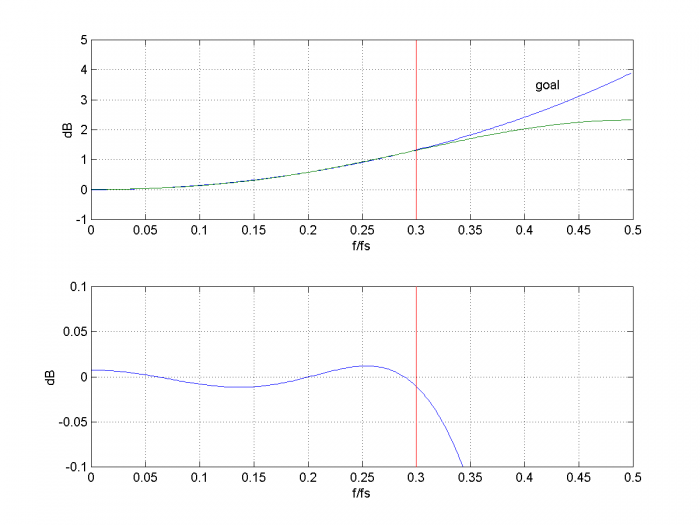 Top: Goal response and sinx/x corrector response. Bottom: Overall response of corrector plus DAC. Figure 4. sinx/x corrector with fmax= 0.375*fs and ntaps= 5.
where b are the floating-point coefficients and k is 2 raised to an integer power. When quantized with k= 512, the coefficients of Example 1 become b_fix = [5 -39 580 -39 5]/512, and they produce the overall response shown in Figure 5. Table 1 lists coefficients and other filter parameters for three fixed-point sinx/x correctors. The coefficients’ maximum number of signed digits is listed for Canonic-Signed-Digit (CSD) implementations . Figure 5. sinx/x corrector with fmax= 0.3*fs and ntaps= 5. Overall response of corrector plus DAC. blue = floating-point coefficients. green= fixed-point coefficients with k= 512. This is a Matlab function to find the coefficients of a linear-phase FIR sinx/x corrector. It uses the Matlab firls function for least-squares FIR design. Note: the number of taps (ntaps) should be odd for best results. % ntaps       number of FIR taps. Should be odd. I like your simple solution for a three tap design. Thanks Neil, and to note it doesn't replace your optimized solution for when a better match is required (or when the decreased stop band rejection is of concern), but wanted to share for the cases when "good enough" is sufficient. Cheers and good work! I am writing about Sampling theorem. In sampling delta pulse train is used. If we take fourier transform the transformed value should be unity . How we get sinc function ? Yes, we treat the signal samples as impulses. This is a choice that makes the math work. However, when we convert the digital signal to analog, we have to deal with real-world DAC's. The DAC output consists of rectangular pulses of length Ts, which gives rise to the sinc response. We are in effect considering the DAC input to be impulses, and its output rectangular pulses. you see the equation of sampling theorem? Why a(n) is the convolution of W(n) with sinc function ? a(n), I guess , is the weighting factor. The formula you reference has to do with Discrete Fourier Transform (DFT) calculation. You may also want to study chapter 4 of Rick Lyon's book, "Understanding Digital Signal Processing". In contrast to this discrete-time view, we treat the DAC output as a continuous-time function. So we use the (continuous) Fourier Transform of a pulse of length Ts to arrive at the sinx/x response in my post.